There are very few 'off the shelf' Passagemaker powerboats. Over recent years the interest in this type of cruising powerboat has increased to such a degree as to encourage us to design several of this very special type of cruising vessel. There are a few boats available that are suitable for modifying; fitting out and equipping for this purpose but these will all need extensive modification if they are to meet the requirements of a true Passagemaker. When one thinks of the history of small boat passagemaking, the first name that springs to mind is that Robert P. Beebe who was the best known as the person who proved conclusively that passagemaking under power was practical. However Robert Beebe was not the first to successfully undertake long ocean passages under power. In 1902 a 38 ft / 11.58 M vessel the Abiel Abbot Low powered by a kerosene engine made the crossing from New York to Falmouth England in 38 days. The Detroit made the next recorded crossing in 1912 / 10.67 M gasoline (petrol) powered 35-ft vessel that made the trip in 28 days. The sheer fortitude of the owners and crews of these vessels can not be overstated. Using the primitive equipment of the time fitted into hulls that we would consider totally unsuitable for the purpose, they achieved if not the impossible, certainly the improbable feat of crossing a major ocean in a small boat under power alone. If you want to read a more detailed report of these early crossings plus more about Captain Robert Beebe then I recommend Beeb's revised book Voyaging under Power, see appendix 1. More recently there have been many long distance passagemaking voyages under power including several round the world epics. In 1983-84 Dutchman Kasemier Eilco made a 200-day circumnavigation from Plymouth to Plymouth. This voyage was accomplished in the 39 ft / 11.88 M aluminium displacement motor cruiser Bylgia 11 of Sneek. Today many more people are making Passagemaking voyages. Providing due care and attention is paid to selecting and preparing a cruising powerboat that is suitable for the passage, this type of cruising can offer more opportunities for adventure combined with pure enjoyment than most other boating activities. There are many differences between a true 'Passagemaker' and a regular powerboat. 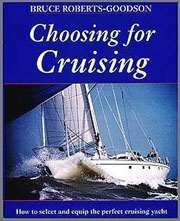 The cruising powerboat that you find at most boat shows or in our own range of stock boat plans may be designed for cruising over hundreds of miles. A true passagemaking powerboat must be capable of cruising thousands, at least 3,000 nautical miles / 5559 Km, without refueling or taking on stores and water. A Passagemaker must be truly self-sufficient and a good weight carrier. 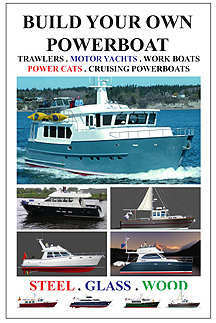 The typical "Trawler Yacht" that is manufactured as a stock off the shelf powerboat is not suitable for passagemaking. The Nordhavn range of long distance powerboats is one of the few exceptions. These boats are designed and built for ocean voyaging. If Passagemaking is to be included in your boating future then you will need to consider a custom designed and built powerboat or trawler. If you require a true Passagemaker then only a displacement hull will be capable of delivering the performance over the distances involved. You will need to carefully balance the factors that go into designing a hull capable of carrying you and your crew over vast distances not only economically but safely to your destination. The factors are Displacement / Length ratio, Speed length ratio, Above water/ Below water area ratio and Prismatic Coefficient. All of these factors together with other hull design parameters must be carefully balanced. Taking these parameters in turn let us consider the effects they will have on a vessel intended to serve as a Passagemaker. longer the vessel the smaller the D/L or conversely the smaller the vessel, the larger the relative D/L. The D/L is not a number that one can select on it's own and then proceed to design the vessel without regard to the other parameters. Speed length ratio (S/L). This important ratio because to achieve your goal of creating a true Passagemaker it will be necessary to pay considerable attention to this parameter. It will be necessary to carefully balance this figure with the other ratios to achieve the speed-v-distance-v fuel used to make the ocean crossing possible. For long passages a S/L of between 1.1 and 1.2 would seem the optimum however the vessel needs to be capable of running economically at the higher S/L of 1.34 (normal full displacement speeds) when cruising the coastal areas where diesel fuel is readily available. The design for every potential Passagemaker needs to be carefully evaluated to decide of the best balance between attained speed and fuel usage. Area above water / Area below water (AB); This ratio has everything to do with stability and safety. In most boats the smaller this number the better the boat. In a design intended for use as a Passagemaker it is vital a low number say under 2.5, is achieved. If you look at modern trawler yachts you will soon see that they in no way could fulfill the requirements of this parameter. Prismatic Coefficient (PC); By tank testing and practical tests it has been proven that for any given S/L there is a correct PC. The correct combination will provide a hull that will achieve it designed hull speed with the minimum of power and consequently the most efficient usage of fuel. You can see why these design parameters must be carefully balanced to provide you with a hull capable of true Passagemaking. Refer to chapter two for more detail. The foregoing are just a few of the parameters that will be considered by the designer or your Passagemaker. You can expect to pay more for the design of one of these vessels than you would for any other type of cruising powerboat. Please take my word for it, your designer will earn his money when designing any powerboat worthy of being called a "Passagemaker". All of systems in a Passagemaker will need to be extremely well thought out and reliable to ensure the success of the voyage. Less than perfect installations and engineering practices that may be acceptable (by some) for coastal and local cruising can not be tolerated in a cruising powerboat that is intended to cross oceans. Many of the features and good practices detailed in this text that we might have considered desirable are in fact essential in a Passagemaker. There is general agreement from those who have experienced Passagemaking voyages that a single engine is the only answer to combining the various elements needed to power a successful vessel of this type. Except in the largest of Passagemakers twin engines are inefficient and usually not suitable for this purpose. While twin engines do offer additional security, other factors and the need for efficient fuel usage outweigh this when crossing oceans. The addition of a wing engine of modest power but capable of driving the vessel in an emergency is recommended not only in a passagemaking vessel but in any other single engined powerboat. It may surprise many how little power is needed to drive a displacement hull at modest speeds and a wing engine can provide this power without adding unacceptable costs to the project. It has often been suggested that the wing engine can double as a power plant to drive the generating set. This may make sense in vessels of over 55 ft / 16.76 M where the expected usage of AC power justifies the size of engine capable of providing power to drive the hull as well as driving the AC generator. Other suggestions have included using the Gen. set to power and electric drive either through the main shaft or through a specially installed wing shaft. There are many ways to tackle the problem of providing the security of an alternate propulsion arrangement in the event of terminal failure of the main engine. One thing to keep in mind it that it is very rare for a well-serviced diesel engine to fail. Usually there is a simple reason why any diesel engine ceases to operate. Most of these problems are avoidable and most are easily remedied on the spot by a person with a reasonable knowledge of the operation diesel engines. Dirty fuel, water in the fuel and air in the system can stop any diesel. Well-designed tanks, care in taking fuel on board (always filter) together with twin filter systems and an adequate supply of spare filters are essential factors. The foregoing and constant monitoring of the systems will go a long way to ensuring that your diesel engine keeps running and running under all conditions. It is obvious that you will need sufficient fuel to reach your destination (plus a reasonable reserve) but what may be not so apparent is that you will need to carefully manage your fuel supply. For instance when you start the voyage you will have full tanks and probably be modestly overloaded however as the voyage progresses and the tanks start to empty then the trim and stability of the vessel will change. How it changes will affect the stability of your Passagemaker and you must ensure that these changes are allowed for in the design and loading of the vessel. Moderate to heavy displacement cruising powerboats have the advantage that the changes in trim due to changes in loading will be minimal compared to those experienced by a lighter displacement vessel. The other aspect of management is in fuel usage. For instance weather can play an important part in the amount of fuel actually consumed verses your best case estimates. You will have noted that slowing down can greatly decrease the amount of fuel used over the same distance. In fine weather you want to put your foot down to cover as much distance as possible while the conditions are favorable and conversely when the going is rough slowing down will not only generally make the motion more acceptable but it will conserve fuel. It is common practice for those undertaking passagemaking voyages to carefully monitor the daily fuel usage against expected usage and requirements to complete the voyage and adjust the speed accordingly. To successfully monitor your fuel you will need some better method than simply relying on the regular fuel gauges. Site gauges which consist of a clear glass tube that is run down the side of the tank is one solution however current thinking is against such devices which can break especially in the case of fire in the engine-room. The calibrated 'dip stick' is hard to beat. Whatever method you use to establish the current rate of usage and amount of fuel remaining you will need to ensure that it is accurate and regularly computed. There are those who swear by this auxiliary power and fail safe propulsion system. This is another case of whatever decision you make you will have a good proportion of the 'experts' agreeing with your choice. One thought worth exploring is the fact that you will most probably have outrigger masts to support your anti-roll 'flopper stopper' system; why not try and work a auxiliary sail plan into this arrangement? Most if not all Passagemaking powerboats will have some form of projection raised above deck level. It would be worthwhile working in some form of sail plan to be used when conditions are suitable or when and if emergency propulsion becomes a necessity. A considerable amount of long distance voyaging is planned to take advantage of favorable winds. This fact alone makes the consideration of sail assistance a sensible option. The best hull form for a long distance Passagemaker is the round bilge type or perhaps radius chine (room for future development) and this type of hull when used in a powerboat is the most likely to have a rolling motion. This motion can be very tiring to the crew and in extreme cases can threaten the vessel itself. Fortunately there are two main methods to reduce and almost eliminate the rolling. At one time If you boat is on the smaller end of the recommended size, say under 50 ft / the decision was a simple one, you had to opt for a passive device such as bilge plates, keel plates or a pair of 'flopper stoppers'. 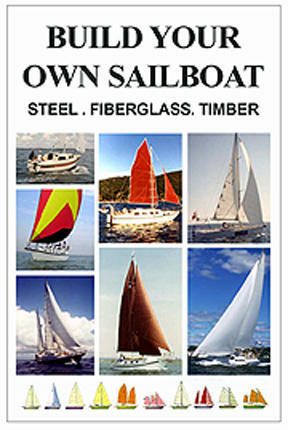 There is another feature that can greatly reduce rolling and that is the use of auxiliary sails. Active devices such as activated fins are now available to suit smaller (remember that relative term) hulls so should explore both options. Other options such as free surface tanks and the like is more suited to large ships and will not be considered here. It should be noted that the easier a boat rolls, the more positive effect an anti rolling device will have on that hull. These devices will be one of your options when it comes time to consider an anti-rolling device to be fitted to your Passagemaker. There are advantages and drawbacks to using either system as you will need one or the other you will need to study that benefits and disadvantages of both systems. This rig is not mechanical so it is less likely to break down and in addition it will cost much less than fitting activated fins. For those who are not familiar with these devices here is a brief description. 'Flopper Stoppers' is the name generally given to a device that has been successfully used by long distance powerboats to reduce rolling. The rig consists of one pole each side of the vessel that is pivoted at or near deck level. The poles are rigged with guy wires so allow them to be swung out at right angles to the vessel and parallel to the surface of the water. Twin triangular devices of about 1 sq. ft / 0.09 sq. M each are suspended by wires from the poles so that the 'fins' are sufficiently below water level to act as stabilizers. The rig generally resembles that seen on prawn or shrimp trawlers except the boards are replaced with the fins. Flopper stoppers have a good behavioral reputation in that they work well on all headings and are particularly effective when running before a gale at lower than normal speeds. These devices can be used in conjunction with anchoring flopper stoppers, which will reduce rolling while at anchor. Another advantage is that they can and usually are taken on-board when not and thus offer no drag or resistance when not required. Of course nothing is perfect and some of the disadvantages of these devices are that the boat will have to be strengthened in certain areas to accept the strains imposed by the rig. The rigging arrangements will need to be designed especially for your boat. The rig takes time and effort to set and this can be difficult in heavy weather. Care must be taken when launching and retrieving the fins so that they do not damage the sides of the vessel. It reported that the drag caused by flopper stoppers (when set) would cost the average Passagemaker between 0.5 and 0.75 of a knot. These devices are noisy however by adding some chain in the rig the harmonic vibration can be reduced if not eliminated all together. 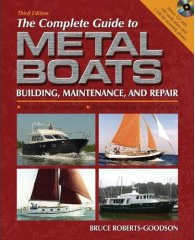 The foregoing is a small extraction from Bruce's book METAL BOATS ... see below.